In this document, we will create a sample Xamarin phonebook application step by step integrated with ASP.NET Zero website. Be aware that only ASP.NET Core version is supported. In the Developing Step By Step document we have already seen how to create a phonebook on server side and web client. In this document we will resume this project. 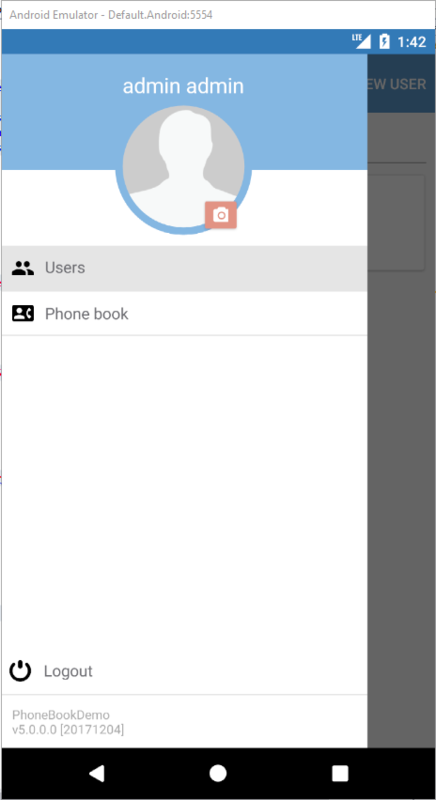 We will build a phonebook application on ASP.NET Zero Xamarin project. Download the solution Acme.PhoneBookDemo and open the Acme.PhoneBookDemo.Mobile.sln file. 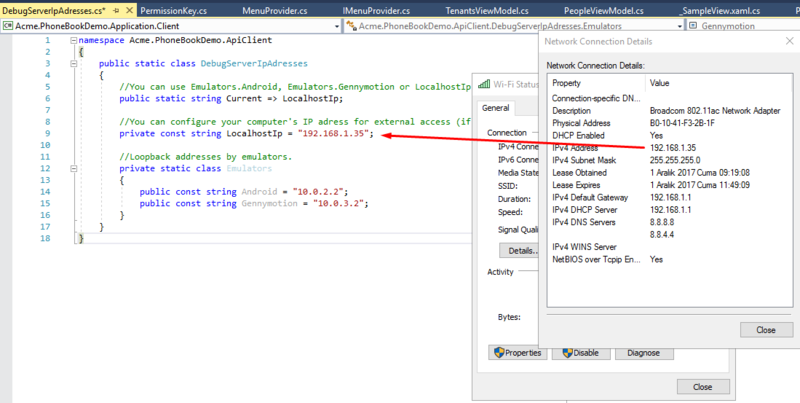 To consume server API methods, we need to implement the IPersonAppService application service over HTTP transmission. 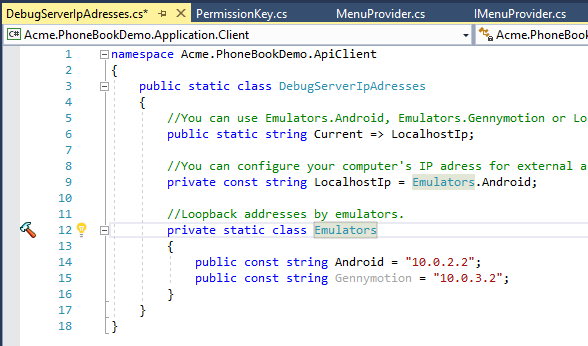 Create a new folder called PhoneBook in Acme.PhoneBookDemo.Application.Client project. Then create a new class called ProxyPersonAppService in the PhoneBook folder. Derive ProxyPersonAppService from ProxyAppServiceBase, IPersonAppService interface. 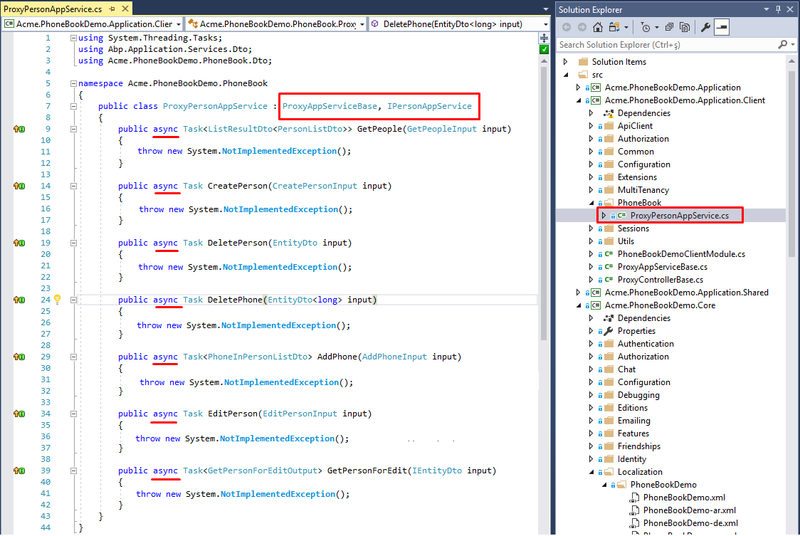 Visual Studio will help us to add all unimplemented methods from IPersonAppService at once. Add async keyword to all methods to be able to benefit from multi-tasking. In the ProxyAppServiceBase class you'll see ApiClient, which is being used to call host web API methods. We'll use ApiClient to transfer data with host. ApiClient has post, put, get, delete HTTP methods. To decide which needs to be called for the corresponding method you can read ASP.NET Boilerplate Application Services as Controllers. If none of the above => Post is used as default. Based on the above information, we will implement the methods. The first method is GetPeople, it starts with Get prefix, so we have to use ApiClient.GetAsync(...) method. When we complete the communication phase with the host service, we can start to create person and person detail view for mobile. Note that "Page" and "View" words are used for same meaning and purpose to refer to XAML files. Firstly we'll create view, then view-model. But it's up to you which side you start. Let's create PeopleView.xaml. PeopleView is going to list all the persons. When we tap one of the person, we'll navigate to person details. The person details page will contain personal information and phone numbers of person. In Acme.PhoneBookDemo.Mobile.Shared project, there's Views folder. All the pages must be located in Views folder. 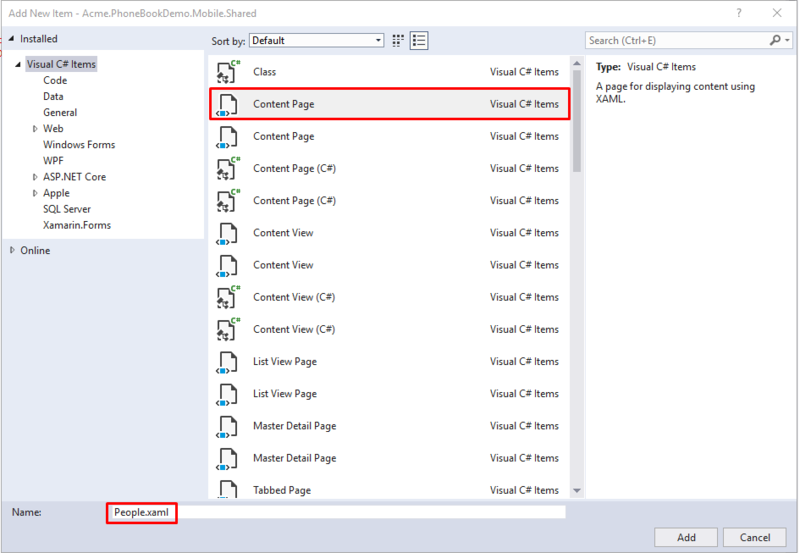 You can create a new empty Content Page as below, but in this example we'll copy and paste _SampleView.xaml file. Copy and paste _SampleView.xaml into the same folder. We'll rename the file. All the views must end with "View" postfix. This is mandatory for auto matching related view-model. So rename _SampleView - Copy.xaml to PeopleView.xaml. The class name in xaml: x:Class="Acme.PhoneBookDemo.Views._SampleView" > x:Class="Acme.PhoneBookDemo.Views.PeopleView"
We have created an empty view. To control this view, we have to create view-model for this view. Next step is creating view-model of PeopleView.xaml. ASP.NET Zero Xamarin app uses MVVM pattern. So each view should have a view-model. According to conventional view-model binding, view-model file names must end with "ViewModel" postfix. So the view-model name for PeopleView must be PeopleViewModel. All view-models must be located in ViewModels folder. You can create a new class called PeopleViewModel in ViewModels folder. But as we did for the view, we'll use the empty template view-model called _SampleViewModel.cs. Thus far we have implemented the proxy class for PersonAppService, created People view and created view-model PeopleViewModel. To be able to see the new view in the app, there's one more thing to do: adding this page to the navigation menu. To add a new menu item, open MenuProvider class in Acme.PhoneBookDemo.Mobile.Shared project. The navigation menu items are stored in a ObservableRangeCollection. This is for notifying view whenever an item changes in the collection. Title: It's already localized in the Developing Step By Step document. We just set localization key with this shortcut: L.Localize("PhoneBook"). And it localizes the menu text. Icon: Download a related png icon file. For this example, go to https://material.io/icons/#ic_contact_phone and download PNGS. Then extract the downloaded zip file. In the zip file, you can use ic_contact_phone_black_24dp\android\drawable-xxhdpi\ic_contact_phone_black_24dp.png as the icon. Copy and paste the file into UI\Assets\Images folder in the Acme.PhoneBookDemo.Mobile.Shared project. Right-click the png file and go to properties. In the Advanced section, set Build Action as Embedded resource. This is mandatory! This will help to share the icon file across platforms. ViewType: Must be the class name of the view in the View folder. The view name is PeopleView, so let's set view type to typeof(PeopleView). Let's run the application to see the new menu item. 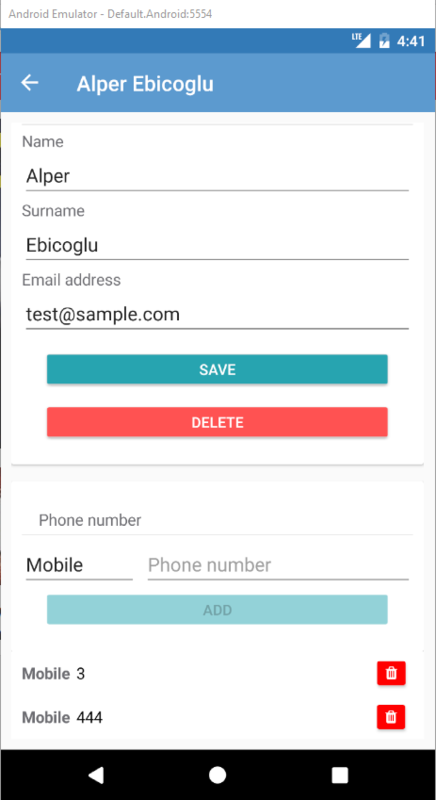 In this example, we'll use Android platform to test the sample. Hence, set the startup project to Acme.PhoneBookDemo.Mobile.Droid. If you've already started Android emulator, you can directly run the project. But if you've not started the emulator yet, it's advised to start the emulator first from the Visual Studio Toolbar as shown below. 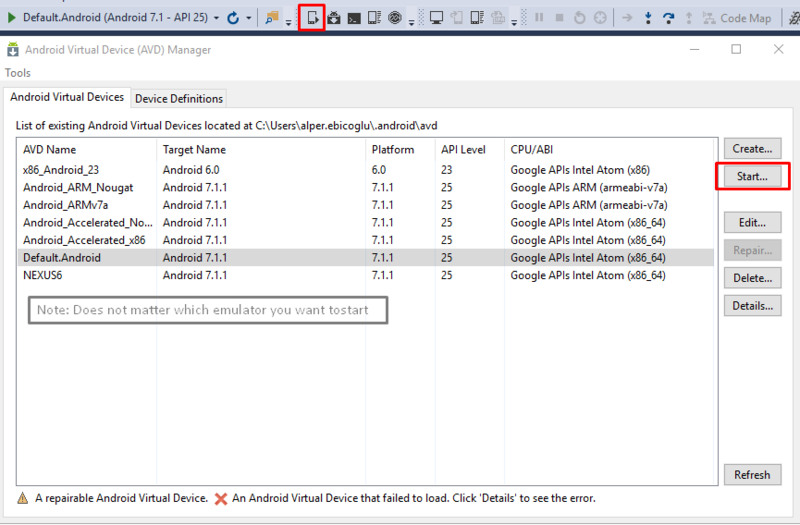 The reason of initializing emulator is: sometimes Visual Studio cannot make initial connection to the emulator for the first run. So it's better to run it and wait until it starts up successfully. When you see the emulator home screen, you can run the project (F5). You will see a splash screen while initializing. After that you'll see the app login page. The PhoneBook is defined on tenant side. You have to switch to a tenant to see the PhoneBook menu item. On the top-right of the screen, there's a toolbar button called Change Tenant. Tap that button and enter default into the textbox. If the tenant default is available, you will see "Current Tenant: default" label. 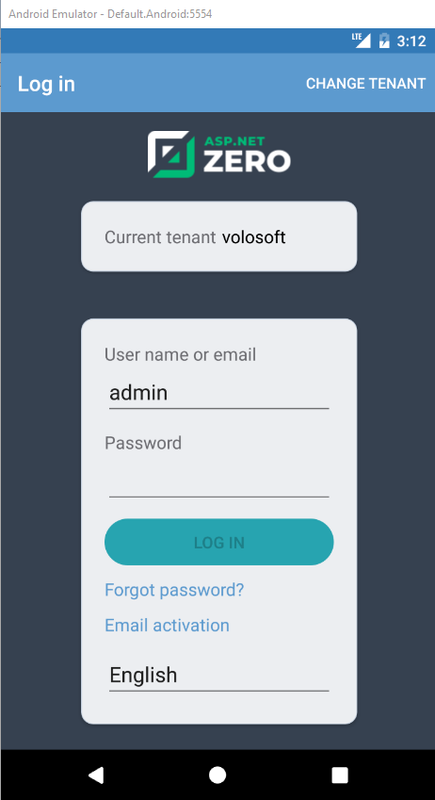 If the tenant is not active or does not exist, then you'll get an alert about that. When you successfully login, you can see the below screen with new Phone book menu item. Up to here we successfully added an empty People page. Let's populate the view with data. There's a placeholder label in <ContentPage.Content> tag. Remove that Label and add the below ListView definition in ContentPage.Content tag. In the below code, we populate the Listview with Persons data. So in the view-model we need a public property Persons. Persons property must be IEnumerable and contain FullName and EmailAddress string properties. All properties that will be binded to view must be public. HasUnevenRows property automatically sizes list view rows for content. The main reason we used TextCell in DataTemplate is performance. Xamarin docs say Use the built-in cells (like TextCell / SwitchCell) instead of ViewCell whenever you can. Persons data needs to be binded in appearing event of page. To achieve this we add a behavior to the page. Add the below code into the ContentPage tag in PeopleView.xaml. This behaviour will execute PageAppearingCommand in view-model. PageAppearingCommand will fetch data from server. For the best user experience and smooth navigation, it's better to start long-lasting operations after you show the view. Never wait the main. Do not run blocking procedures in constructor. In the PeopleView we have used Persons as items source of ListView. So PeopleViewModel class needs to have a property called Persons and a command called PageAppearingCommand. To search and filter people we'll use SearchBar, which is Xamarin built-in control that provides a search textbox. Open PeopleView.xaml and add the SearchBar before the ListView control. We'll bind FilterText property to the SearchBar. If FilterText changes, it'll start to filter from server. Now open PeopleViewModel.cs and add the below code. In setter of FilterText property, we execute SearchWithDelayAsync() method. As we cannot run async method in property setter, we use AsyncRunner to make it sync. In SearchWithDelayAsync method, Task.Delay is used to wait for new key press. If user changes the filter text within the delay duration, then fetching will stop for new key press. We've specified the delay in PageDefaults.SearchDelayMilliseconds as 1 second. If no new keypress in 1 second, it'll start to search. Person details page will show personal information and phone numbers of selected person. We will be editing personal information, adding and removing phone numbers of the person. Also we'll use the same page for creating new person and deleting existing person. To be able to navigate to this page, user will tap on a person in the PeopleView. We'll first create view, then view-model of the page. Let's start with creating the PersonDetailsView.xaml. Basically, we'll do the same steps as we did for PeopleView page. Copy/paste _SampleView.xaml and rename the file as PersonDetailsView.xaml. Open PersonDetailsView.xaml and replace all _SampleView to PersonDetailsView. Delete the <Label> in PeopleDetails.xaml. 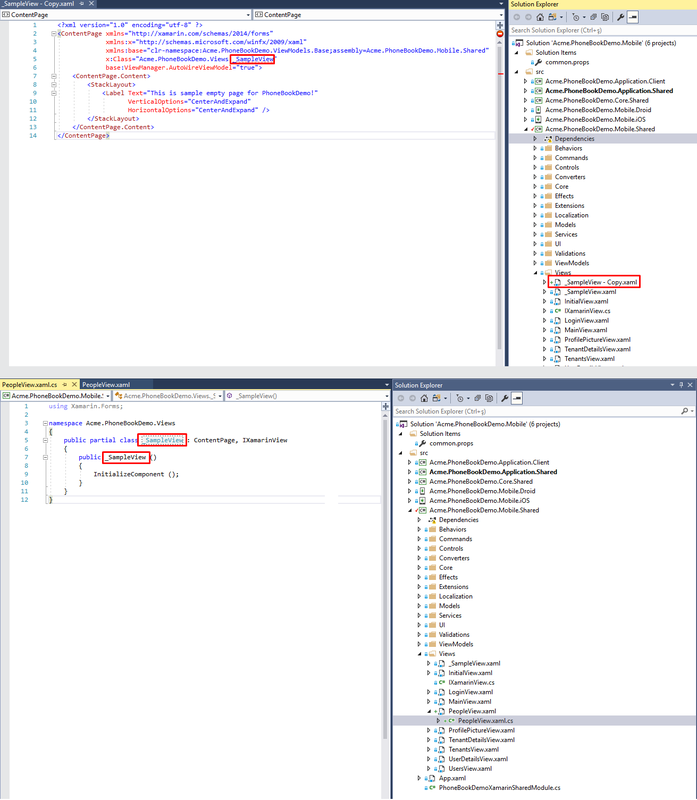 Go to code behind (PersonDetailsView.xaml.cs) and rename all _SampleView to PersonDetailsView. Now we have an empty view. Let's put controls inside the PersonDetailsView.xaml. The view will have 2 main sections. Personal information on the top and phone numbers on the bottom. Let's create personal information section! Add highlighted rows to ContentPage tag. xmlns:extensions: To use Translate extension. xmlns:controls: To use CardView control. x:Name: To use as reference. Title: To show a page title. It'll dynamically change. For new person creation, we'll write "Create New Person", for existing person edit we'll write the name of person here. 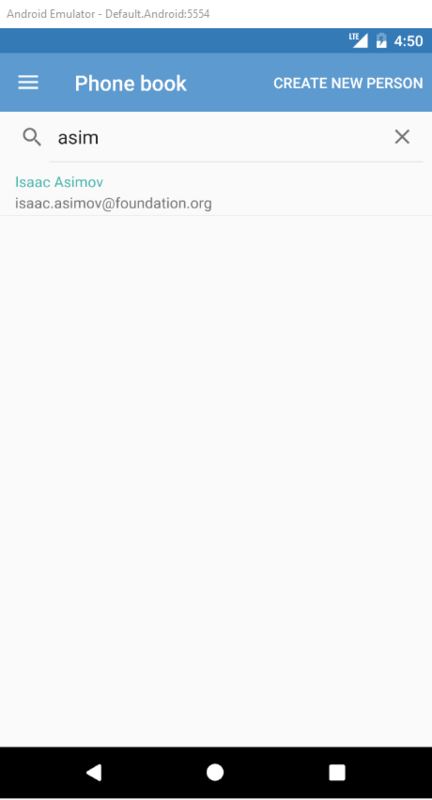 ListView works best when it's the root element (otherwise you may have scrolling issues). That's why we put ListView in the first place. ListView consists of 3 parts: Header, Items, Footer. 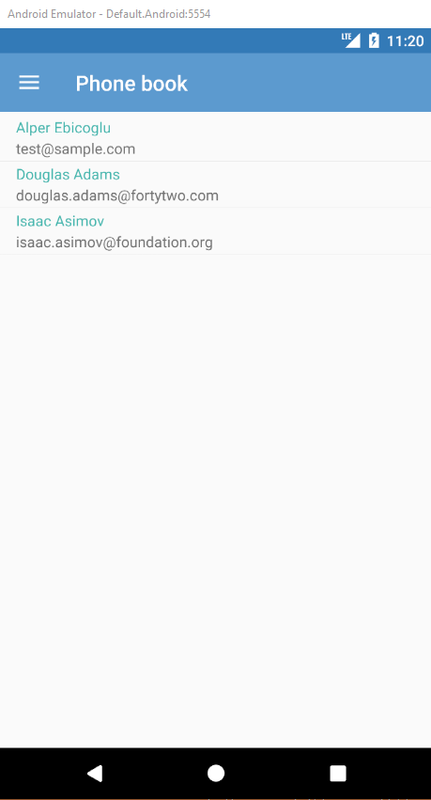 We'll use header to show personal information and items to list phone numbers. Footer will not be used. We set ListView HasUnevenRows="True". This is for automatically sizing list view rows. In the ListView.Header tag, we place a CardView. This is a custom control that draws a border to highlight section. LabelSection is another custom control that shows label as a title. Divider is a custom control as well that draws a horizontal line. In CardView, add a <StackLayout> to show elements vertically. 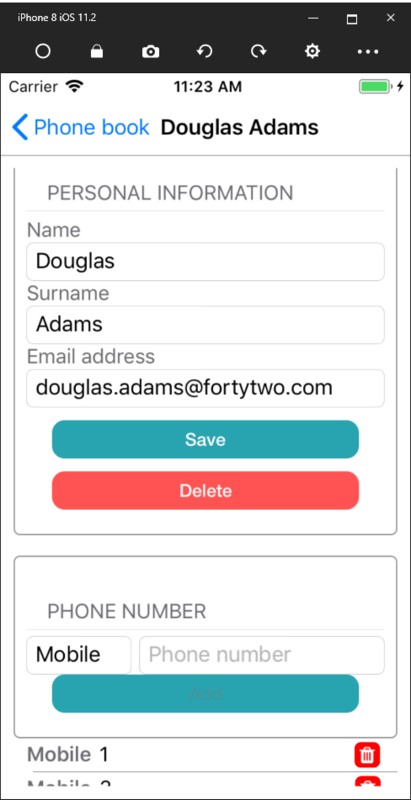 Put labels, entries for Name, Surname and EmailAddress fields. All the entries are TwoWay binding, because we propagate value in both directions. Try to use ListView as root item of the Page. Do not use nested ListViews (ListView in ListView). Use TextCell and SwitchCell wherever you can. Avoid placing a ListView inside a ScrollView. Inject IPersonAppService to the constructor. This is for data transfer with server. To save user, create an async method called SavePersonAsync(). This method will update existing person or create new person and it'll be used in the command of save button. Create a command for save button. Another important property is the model. Create a public property with name Model. RaisePropertyChanged event helps to notify view that model is changed. To retrieve the selected person from PeopleView, we'll use the InitializeAsync(object navigationData) method. This method is located in the base class of view-model and is being executed by navigation service. You need to cast navigationData to your specified type. We'll use the same view-model for new person creation. So if navigationData is null, it means it's a new person. Create a private bool property called IsExistingPerson for new person or existing person discrimination. And add IsAddPhoneButtonEnabled to disable AddPhoneNumber button if input is not valid. Up to here, we listed people and update one of them by tapping on the person item. Now let's implement new user creation functionality. We've already covered create person in PersonDetailsViewModel. We'll just need to navigate to PersonDetailsView with an empty navigationData. The rest will work fine. Creating new person needs permission. Open PermissionKey class and add the below line for shortcut. We'll use it to hide/show Create Person button. Open PeopleView.xaml and add the lines to the ContentPage tag. The x:Name gives a name to the page. It'll be needed for being referenced in toolbar item. And we import permission namespace to use PermissionKey class. Adding a toolbar item is easy! Insert toolbar item into ContentPage.ToolbarItems as a child. We used a special toolbar item, which is derived from ToolbarItem. This extended toolbar item can be visible/hidden by binding property. The default ToolbarItem has no such feature. In the IsVisible property, we used HasPermission extension. This extension is located in Extensions\MarkupExtensions. It returns true/false according to the Text property. And as a Text property, we pass PermissionKey.PhoneBookCreatePerson. The command property is being executed when button is tapped. We binded CreateNewPersonCommand. In the next step, this command will be added to the view-model. Now open PeopleViewModel.cs and add the below code. We navigate to PersonDetailsView with null parameter, because we handle the null case as new person creation. We've implemented create and update person functions, but we didn't validate input. Validating an object before sending to server is very easy. Open PersonDetailsViewModel.cs and add Validate() method. To test it, run the app and try to create a person with an invalid email address. Add the delete permission key in PermissionKey.cs. We'll place a delete button inside the person details view. So open the PersonDetailsView.xaml and add the button as highlighted below. In the next step, we'll add DeletePersonCommand in view-model, as it's used as button's command. And visibility of button is being binded to IsDeleteButtonVisible property. The reason is we'll hide the button if user has no delete permission or it's a new user creation page. Open PersonDetailsViewModel.cs and add the highlighted codes. We inject IPermissionService to check whether user has delete permission. The delete button will be visible if user has permission. The delete button is binded to IsDeleteButtonVisible property. We create the DeletePersonCommand. In this command, we ask user for a confirmation with UserDialogs.Instance.ConfirmAsync(...). If user accepts, we make request to server with _personAppService.DeletePerson(...), then we leave the screen with NavigationService.GoBackAsync() method. To delete a phone number, we put Iconize button. This control uses Font Awesome to create a button with icon. The only disadvantage of the control is: you cannot use text and icon at the same time! For more information about iconize library, you can check out https://github.com/jsmarcus/Xamarin.Plugins/tree/master/Iconize/. The command property of IconButton is a bit different than usual binding. The reason is DeletePhoneNumberCommand is not in PhoneInPersonListDto. But it's a root property located in view-model. That's why we set Source of command to PersonDetailsPage and Path to BindingContext.DeletePhoneNumberCommand. Setting CommandParameter to "." refers to PhoneInPersonListDto. So we'll be sending PhoneInPersonListDto as parameter to DeletePhoneNumberCommand in the view-model. Let's create DeletePhoneNumberCommand in the view-model. Open PersonDetailsViewModel.cs and add these methods and property. To add new phone numbers, add a new CardView to PersonDetailsView.xaml. In this document, we built a complete example that covers most parts of the ASP.NET Zero Xamarin development. We intentionally used different approaches for similar tasks to show you different styles of development. ASP.NET Zero provides an architecture, but does not restrict you. You can decide on your own style of development.